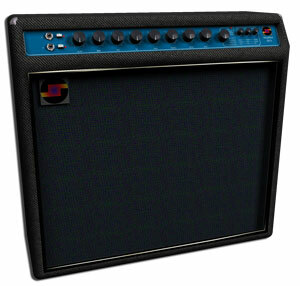 The FV-1 is ideal for putting simple effects into a guitar amp, adding value and usefulness to the customer. Traditional effects like tremolo and reverb are easily integrated at low cost, with the added feature of low parts count and solid state reliability. Although the more advanced effects should probably be left to the customer’s choice of pedals, certain basic effects can easily be added to the amp’s effects set, such as delay, repeating echo, chorus and perhaps even flanging. The FV-1 allows three direct controls for the user to adjust, making the final product more flexible, easy to understand and usable. With the FV-1, it is not required to develop the effects section of a guitar amp as a ‘module’, interconnected through cables and connectors, because the FV-1 is so small and simple that it can be designed into the main circuit board that carries the front panel controls. A simple front panel layout can support a simple switch to select between effect types, with reverb always available. Further, the FV-1 was designed so that its control inputs can be shorted to ground to defeat an effect. With the inclusion of a few resistors into the design, external footswitches can be used to defeat both reverb and effects functions.